New research has highlighted the importance of social and emotional development to children’s success in school and in life.1 Prolonged family stress can negatively affect a child’s social, emotional, and cognitive development, while strong bonds with adults are protective and can help mediate other environmental stressors.2 When a young child has behavior problems, however, those bonds are tested. 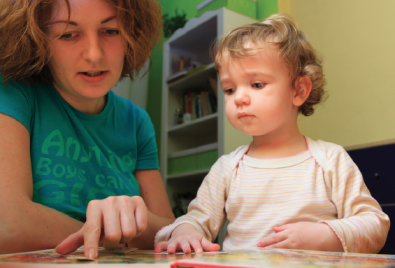 Parents and caregivers need skills and techniques to support young children’s healthy development and positively manage challenging behaviors, while children need age-appropriate tools and techniques for managing emotions. Help children form strong and protective bonds with caring adults by providing comprehensive social-emotional and behavior management supports to parents, children, and teachers. The Incredible Years® curriculum, as implemented by the Colorado-based non-profit Invest in Kids, is a series of in-classroom and small-group trainings that help children, parents, and teachers manage behavior and social-emotional development. This high impact opportunity is, in fact, two programs in one: Incredible Years® is an evidence-based curriculum, while Invest in Kids is one of several organizations delivering the curriculum. Other organizations also deliver the Incredible Years® curriculum, but Invest in Kids has a particularly successful model for delivery. The Incredible Years® curriculum was developed in the early 1980s to help treat children with serious behavioral disorders.3 It has since been adapted to provide preventative training and behavior management skills to children, as well as to adults caring for children with a high likelihood of behavioral issues; the goal is to prevent both the problem behaviors and the subsequent strain on a child’s relationships. The curriculum includes video and discussion-based lessons designed for parents, teachers, or children in a small group or classroom setting, with a suggested duration of 14-18 weeks. Incredible Years® is now a for-profit company that sells its materials to implementing organizations. All Invest in Kids implementation is in support of the preventative (rather than therapeutic) use of the Incredible Years® curriculum. At home, 58% of children whose parents and teachers received the program decreased their negative behavior, compared to 36% of children in the control group. At school, 96% of children whose parents and teachers received the program showed at least a 30% reduction on measures of non-compliance with teachers, compared to 56% of control children. On a social competence scale (a measure of peer interaction), 71% of program children whose initial scores were outside the normal range moved into the normal range, compared to 37% of control children. Improved classroom management by teachers: All students (whether at high or low risk for behavior issues) benefit from improved classroom management, as it leads to increased time for instruction and learning. Materials and certification training prices for Incredible Years® are fixed by the for-profit program developers. Once the implementing organization purchases the curriculum materials and trains their facilitators, those costs do not reoccur except with facilitator turnover. 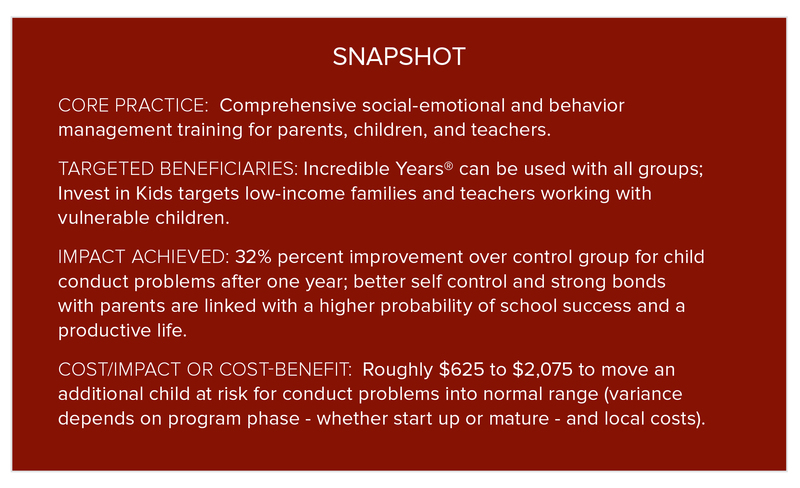 Nonetheless, implementation costs vary considerably by location, program type (parent group, teacher, or child training), and whether the program is in a start-up or mature phase. Invest in Kids estimates that, across all programs, phases, and locations, their average per-child cost of providing the Incredible Years® curricula is about $120, while the per-family cost is around $200.6 These estimates include costs related to provision of evaluation and technical assistance services, which Invest in Kids subsidizes to lower costs for local level program implementers. Programs are funded through a combination of philanthropic donations and a range of government funding streams. Donors interested in Incredible Years® may want to consider funding an umbrella organization like Invest in Kids, as centralizing the start-up costs of facilitator training, curriculum purchase, evaluation, and technical assistance can help lower start up and some implementation costs for a group of smaller, community-based organizations. Take Action: Use this online mapping tool to locate organizations implementing Incredible Years®. 1 Duckworth A. L & Seligman, M. Self discipline outdoes IQ in predicting academic performance of adolescents. Psychological Science 16(12) 939-944. Also, Moffit et.al A gradient of self control predicts health, wealth, and public safety. Proceedings of the National Academy of Sciences, vol 108, no.7 2693-2698. 3 Professor Carolyn Webster-Stratton at the University of Washington founded the program. 4 Duckworth A. L & Seligman, M. Self discipline outdoes IQ in predicting academic performance of adolescents. Psychological Science 16(12) 939-944. Also, Moffit et.al A gradient of self control predicts health, wealth, and public safety. Proceedings of the National Academy of Sciences, vol 108, no.7 2693-2698. Also, Lopez Turley, R., Desmond, M. & Bruch, S.K. (2007) Unanticipated educational consequences of a positive parent child relationship. Journal of Marriage and Family, October 2007, 1377-1390. 5 Webster-Stratton, C. Reid, M. J. and Hammond, M. Preventing Conduct Problems, Promoting Social Competence: A Parent and Teacher Training Partnership in Head Start. Journal of Clinical Child Psychology 2001, vol. 30, no. 3 283-302. 6 Based on total enrollment in 2013. 7 To estimate the high point of this range, we used sample program start-up budgets provided by Invest in Kids. Start-up Parent Group – $9,500 (assuming a group of 16); Start-up Classroom Program (2 classrooms) – $4,500; One time Teacher Classroom Management training – $1,130.